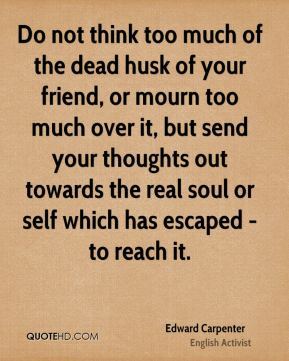 Do not think too much of the dead husk of your friend, or mourn too much over it, but send your thoughts out towards the real soul or self which has escaped - to reach it. 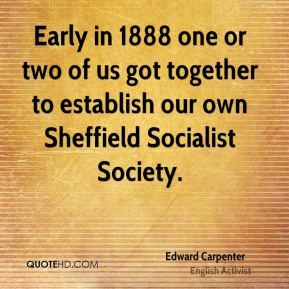 Early in 1888 one or two of us got together to establish our own Sheffield Socialist Society. 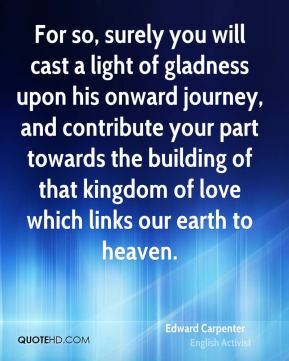 For so, surely you will cast a light of gladness upon his onward journey, and contribute your part towards the building of that kingdom of love which links our earth to heaven. 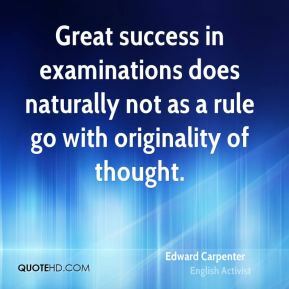 Great success in examinations does naturally not as a rule go with originality of thought. 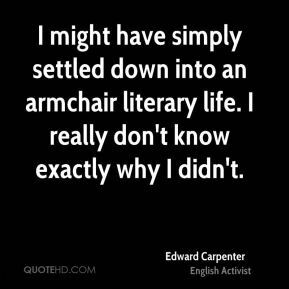 I might have simply settled down into an armchair literary life. I really don't know exactly why I didn't. 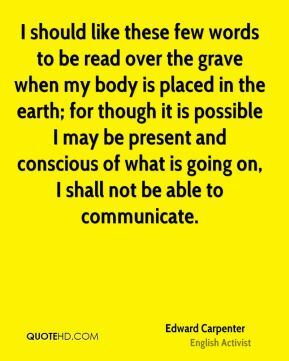 I should like these few words to be read over the grave when my body is placed in the earth; for though it is possible I may be present and conscious of what is going on, I shall not be able to communicate. 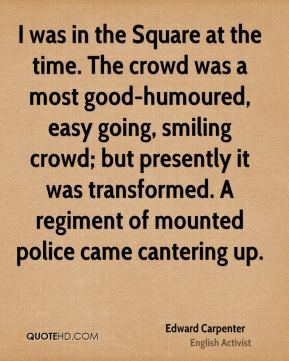 I was in the Square at the time. 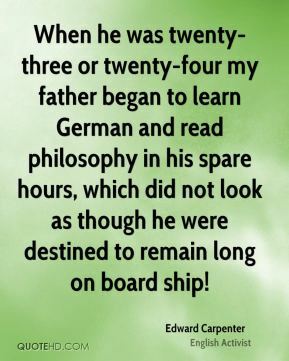 The crowd was a most good-humoured, easy going, smiling crowd; but presently it was transformed. A regiment of mounted police came cantering up. 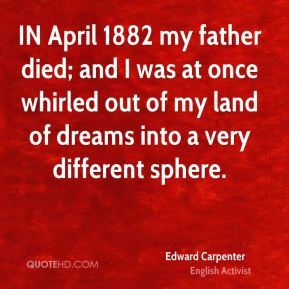 IN April 1882 my father died; and I was at once whirled out of my land of dreams into a very different sphere. 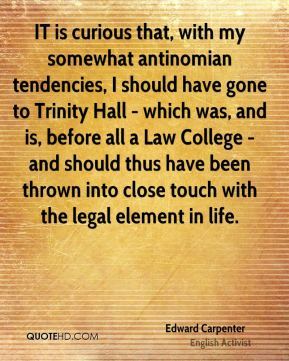 IT is curious that, with my somewhat antinomian tendencies, I should have gone to Trinity Hall - which was, and is, before all a Law College - and should thus have been thrown into close touch with the legal element in life. 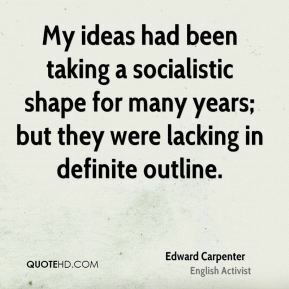 My ideas had been taking a socialistic shape for many years; but they were lacking in definite outline. 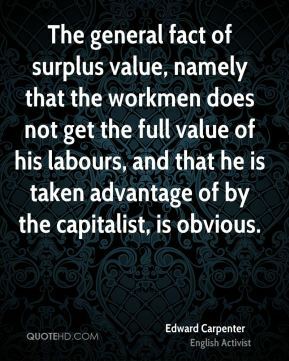 The general fact of surplus value, namely that the workmen does not get the full value of his labours, and that he is taken advantage of by the capitalist, is obvious. 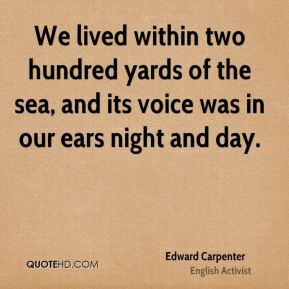 We lived within two hundred yards of the sea, and its voice was in our ears night and day. 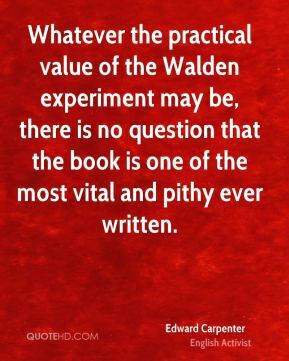 Whatever the practical value of the Walden experiment may be, there is no question that the book is one of the most vital and pithy ever written. 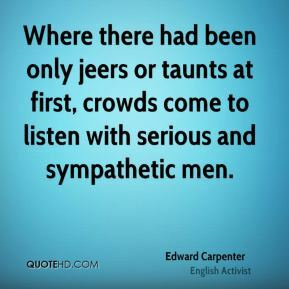 Where there had been only jeers or taunts at first, crowds come to listen with serious and sympathetic men. 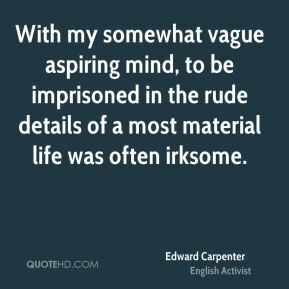 With my somewhat vague aspiring mind, to be imprisoned in the rude details of a most material life was often irksome.